A full redesign and new content management system for GetSmartAboutDrugs.com, a website developed to inform and educate parents and teachers of teenagers about drug abuse. The website needed a fresh, responsive design that would work on desktops, tablets, and phone screens. The site architecture and navigation needed a complete reorganization. It needed a way for important information to be highlighted around the site. Additionally, all of the content needed to be revised to reflect the website’s new voice. Finally, the DEA needed a user-friendly content management system for non-technical staff to easily add and edit content. 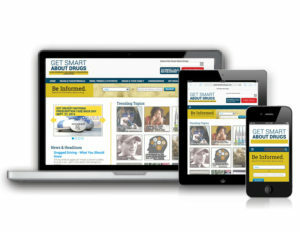 With its stiff blue colors and authoritative tone, GetSmartAboutDrugs.com had the look and feel of a cop lecturing to his or her audience, rather than someone who listened to and shared insightful information with parents. It was important to create the kind of voice would most effectively engage readers. WCM worked with the DEA team to help uncover this individual voice through a personality exercise. After working out details from occupation to choice of hobbies, we came up with the ideal voice for Get Smart About Drugs. The voice was that of a physician in his 50’s, who was also a parent of a teenager. He was smart and knowledgeable, but understanding and compassionate because, after all, he was a dad too. Once the voice and tone were established, we were able to re-write much of the content into shorter, easier-to-digest information, with more images. The content was re-organized into a clearer, straight-forward navigation that required fewer clicks to reach. WCM’s user survey results showed that readers wanted more news updates, images to accompany profiles of drug types, and ways to get help for a troubled teen. We incorporated all of these elements into the new site and work with the DEA to update the site daily with news summaries on statistics, studies, tips for talking to teens, personal stories and community involvement.